July 12, 2016 -New Yorker Electronics has announced the addition of the Vishay SiC530 TrenchFET VR Power IC to its line of power integrated circuits. 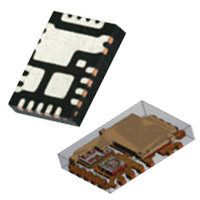 Combining a driver and high- and low-side MOSFETs in a 3.5mm x 4.5mm PowerPAK® package, Vishay’s SiC530 offers a 45% smaller footprint than discrete solutions while delivering high power density with 30A continuous and 40A peak current capability. The SiC530 is an integrated power stage solution optimized for synchronous buck applications to deliver high current, high efficiency and high power density performance. The Vishay 2016 Super 12 Featured Product also enables voltage regulator designs to deliver up to 30A continuous current per phase. The internal power MOSFETs utilizes Vishay’s state-of-the-art Gen IV TrenchFET technology, providing industry benchmark performance to significantly reduce switching and conduction losses. The SiC530 incorporates an advanced MOSFET gate driver integrated circuit with high current driving capability, adaptive dead-time control, an integrated bootstrap Schottky diode and zero current detect to improve light load efficiency. The driver is also compatible with a wide range of PWM controllers and supports tristate PWM and 5V PWM logic. To increase light-load efficiency the driver IC incorporates diode emulation mode circuity and zero-current detect, enabled by a pin. With diode emulation active, zero current crossing of the output inductor is detected and the low-side MOSFET is turned off (asynchronous to the PWM signal), ensuring discontinuous conduction mode. Adaptive dead time control is included, as is undervoltage lock-out. To improve the light load performance, a user selectable diode emulation mode function is also included.